Mount Apo, the Philippines' highest peak and Mount Mayon, the world's perfect cone are two of the most popular mountains in the country. Both are quite challenging, with the former requiring lots of effort and conditioning and the latter being an active volcano that might erupt anytime. Additionally, the Philippines has a lot more other mountains that are ideal for hiking. #1 - Mount Pulag: The third highest mountain in the Philippines and the highest in Luzon, Mount Pulag is a good warm up before going in for a hike in Mount Apo. Located in the cold regions of Benguet and Ifugao, hikers climb it mainly for the cold weather, the phenomenal rolling sea of clouds, and the breathtaking view of the Milky Way at dawn. The climb may be somehow difficult but definitely worth it. #2 - Mount Pinatubo: Famous for its destructive eruption in the early 90's, Mount Pinatubo proves to still be beautiful even after the chaos. In fact, the summit gives hikers a rewarding view of the majestic crater lake called Lake Pinatubo. Aside from hiking, the more adventurous ones can take on the Skyway trail with four-wheel drive jeeps to a drop-off point to trek to the crater. #3 - Mount Pico de Loro: Very accessible from Manila, Pico de Loro in Batangas is one of the famous weekend getaway spots for hikers. Aside from the stunning backdrop from the summit, the trademark of this mountain is the rock monolith called the Parrot's Peak that the brave souls could climb. Sadly though, due to the massive loss of vegetation, it is sometimes closed off for climbing so better check it first. #4 - Mount Balagbag: A part of the Sierra Madre mountain ranges, Mount Balagbag is a beginner's favorite due to its gradual ascend. It usually takes just an hour or two to climb but the challenge is the wide open sky as it lacks trees to shelter from the sun. The view of Metro Manila from its summit is very fulfilling, especially at night when the city lights are on like sparkling stars on the ground. 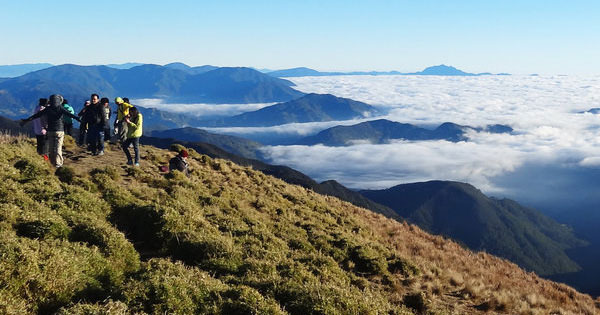 #5 - Mount Ulap: Often described as mini Pulag, Mount Ulap which is also located near Baguio City is the easier trekking choice for beginners who wanted to try hiking in a cold weather. Since its opening to the public in 2015, it became viral that many tourists, even celebrities, went there to climb it. Get closer to the clouds and wake up to the sunrise as they have overnight campsites, too.